Without question, we’d all like to think we’re all independent geniuses, following our wits and whims without worry and question. Ask any sales and marketing person, though, and they’ll tell you that their job is to make sure that either doesn’t happen or that they catch on to a trend early enough that they can exploit our basest whims to their fullest commercial potential. Burger King will top your Whopper with as many strips of bacon as you can afford (someone in Japan ordered 1,050) and sell you a bacon ice cream sundae for dessert. 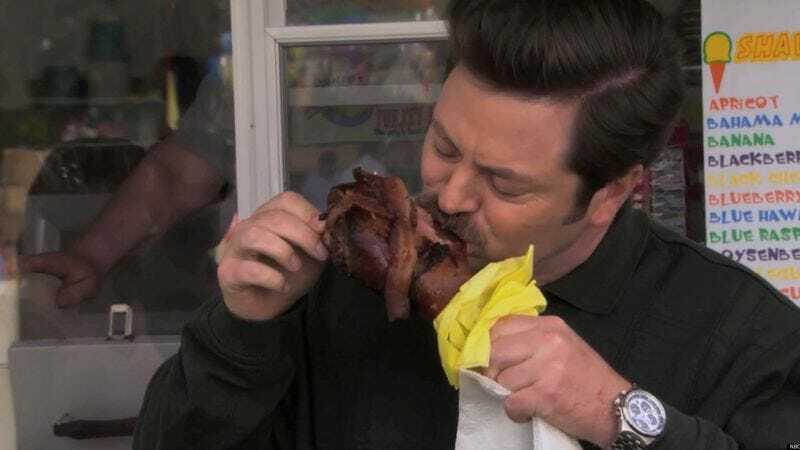 Denny’s (DENN) introduced an all-bacon Baconalia menu in 2011, featuring BBQ Bacon Mac ’n Cheese Bites and other dishes that were really just piles of bacon with some other ingredients… By 2008, bacon had completed its journey from an ignored, unwanted meat to a viral meme—the edible equivalent of cat videos. That year, according to the website Babycenter, 11 out of every million babies born in America were named Bacon. The entire thing is over on Bloomberg Business and is well worth a read, especially if you’re looking for some meaty talking points for the Thanksgiving table.